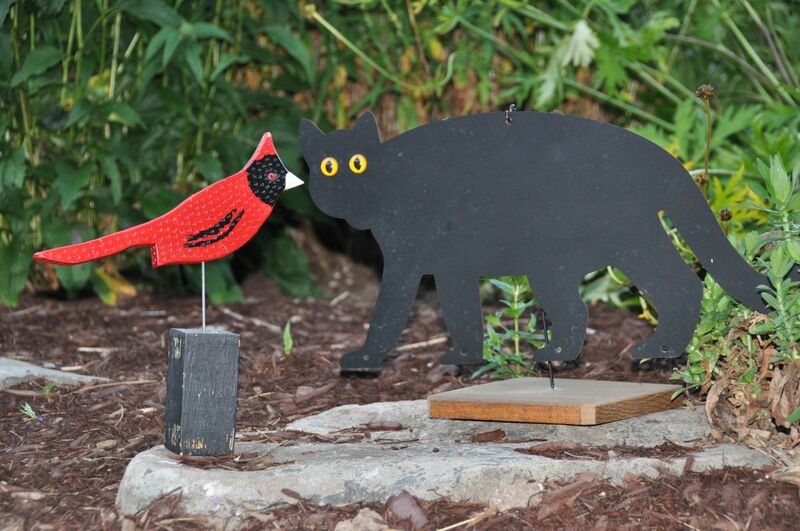 Can Cats and Birds Share a Home? Many pet owners enjoy both feathered and furry friends. But as we have all seen in cartoons, the cat always chases the bird. By nature, cats tend to be the predator and birds the prey. Those of us who have an outdoor roaming cat might just find a dead bird on our doorstep one day as proof of this. But what if we want to enjoy the delightful sounds of a songbird or the companionship of a talking parrot? Can we also keep our cuddly furry friend as well? 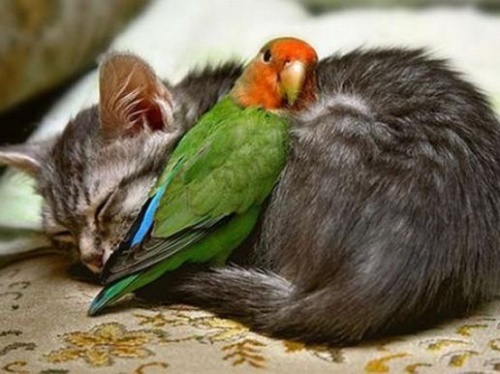 It is possible for cats and birds to co-exist in the same household. There are some important precautions and living arrangements that should be considered. Cats carry a bacteria in their saliva called Pasteurella. It is not harmful to the cat, dogs or humans but can be lethal to birds. Birds can contract this bacteria from a cat bite and die within 24 hours as the bacteria rapidly multiply in their bodies. Even a small scratch on the bird from a swatting cat can lead to infection. Antibiotics must be administered in that 24 hours to prevent death to the bird. Even mild-mannered cats cannot control their predatory nature and instinct to kill a small animal. Think about the way cats play with toys dangling from a string or flitting around them. A cat will chase, pounce and attack the toy. Stalking and pouncing are reflex actions for cats. You would not want this type of reaction to occur with your beloved feathered friend. It is best to keep a bird in a strong, solid cage high up on a stand or hanging hook that is away from furniture. Be sure that the cage has a secure, child-proof lock and that there are no free-sliding doors. Cats should not be able to reach the cage when they jump up. If the cage is within the cat’s reach, he might frighten the bird even to the point of death by pawing or pouncing at the cage. A cat sitting and staring constantly at the bird can cause the bird stress. This stress can lead to destructive behaviors on the part of the bird such at biting or feather plucking. If you have to leave the house, it is best to keep the cat and bird in separate rooms with the doors securely fastened. Small birds such as finches and canaries usually stay within the confines of their cages and are content to be there. However, larger birds such as macaws and cockatoos enjoy interacting with people and like to be let out of their cages to play with their owners or explore. At times like these, cats should be kept away in a separate area of the home or well supervised by a second person in the room. Believe it or not, larger birds may become aggressive towards cats. A bite from a big bird can even break the skin of the cat and require stitches. Keeping the bird and the cat in separate areas and giving them both the attention they need is the best thing you can do. Enjoy your feathered and furry friends and keep them safe!